After a month or so of working hard on some other stuff I went mad and bought an advertised-as-working EDP Wasp off eBay for, er, well, some money. A bit more than I’d like, but nowhere near as much as some people are asking. It arrived in a reasonable sort of state – there’s a hairline crack through one corner and one of the screw holes is also cracked a bit, and a couple of the pot shafts aren’t 100% perpendicular to the board, but well apart from all that. And it sounds great. Even just droning a single note with the filter being opened and closed slowly is really satisfying, but there were a few things that weren’t quite right. The bottom key didn’t work (as mentioned in the auction), the VCA envelope was stuck on repeat, and some of the keys played the same note as the one before. The key not playing was just down to a break in the track underneath one of the 4016s attached to the keyboard, which had been kind-of-not-really fixed by a previous owner. The always-on-repeat VCA was just the wire from the switch on the rotary pot coming loose. The keyboard problem was trickier to nail down. The service manual offers up suggestions of how to check the state of the keyboard encoding at a couple of places. 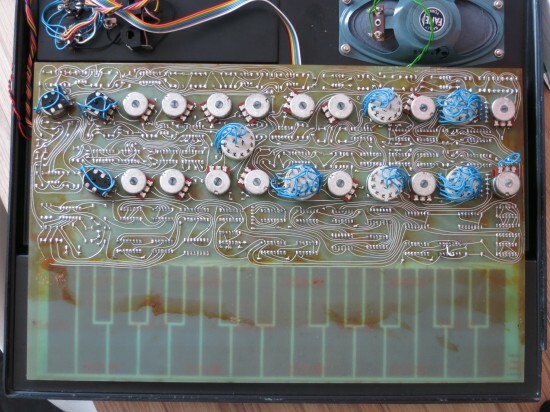 I found that the binary code produced by the 40174 flip flop which holds the state of the keyboard was fine apart from the least significant bit, which was generally only getting up to 1.38v, apart from two notes where it hit 4.8v. I then spent about two weeks (I’m not kidding) of evenings trying to work out what was going on. By the end of this I’d replaced most of the >30 year old ICs in the keyboard section. The Wasp has a double sided PCB but the traces aren’t connected through the board, so you need to solder on both sides, which is a horror. It’s really easy to lift tracks. 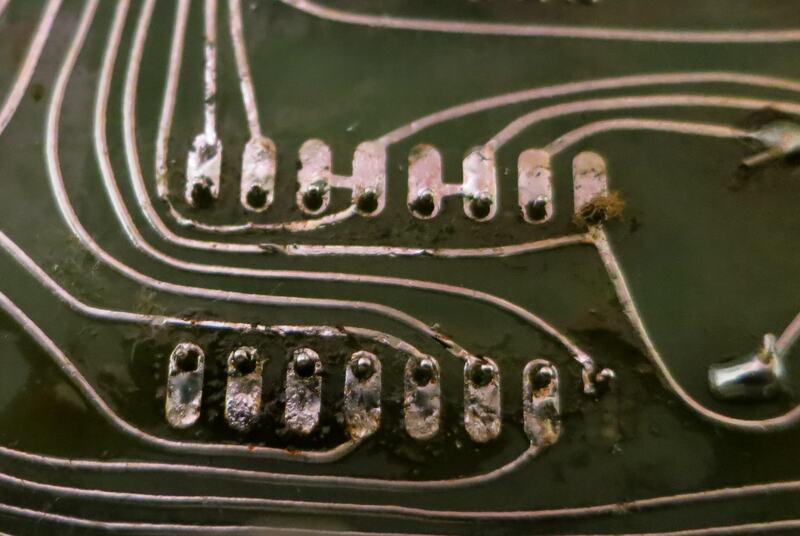 The best way I found to remove the chips was to clip the legs close to the IC body, and then use a soldering iron and solder sucker to take out the remaining legs. If I clipped too close to the board there was a danger of lifting the pad and track. After removing the chip I repaired any tracks that need fixing and put in sockets, gingerly soldering any pins on top first. It helped to leave a bit of solder on the pads for this. The 78L05 was only getting up to 4.8v, so I replaced that as well, more out of hope than anything. I started to wonder if the same note on two keys thing was some sort of timing issue, so out came the oscilloscope, and everything seemed fine. 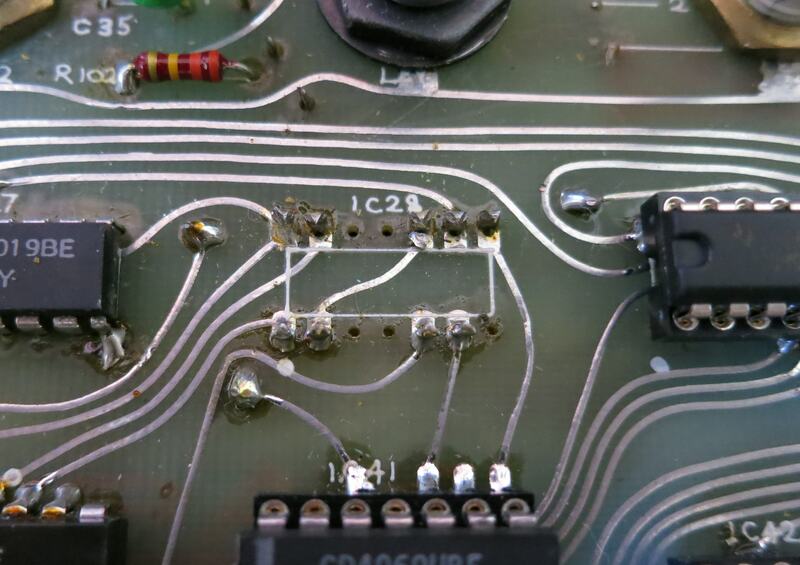 The breakthrough was lifting the leg of pin 2 on the IC30 and seeing that it did get up to 5v on every other key when it wasn’t connected to anything else. 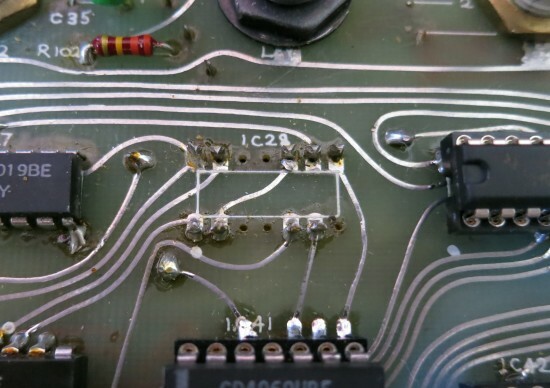 At the other end is (at IC27) was a 4019 which had been replaced by a previous owner, and looking at the tracks on the back of the PCB, I could see they were pretty close together at that point, and there was a short. Fffffffffff. I’d already chopped the legs of the 4019 so I replaced it, cleaned the solder off, and… it worked. Two weeks of head scratching, and the problem was down to a previous owners’ fix. Lesson learned, really. 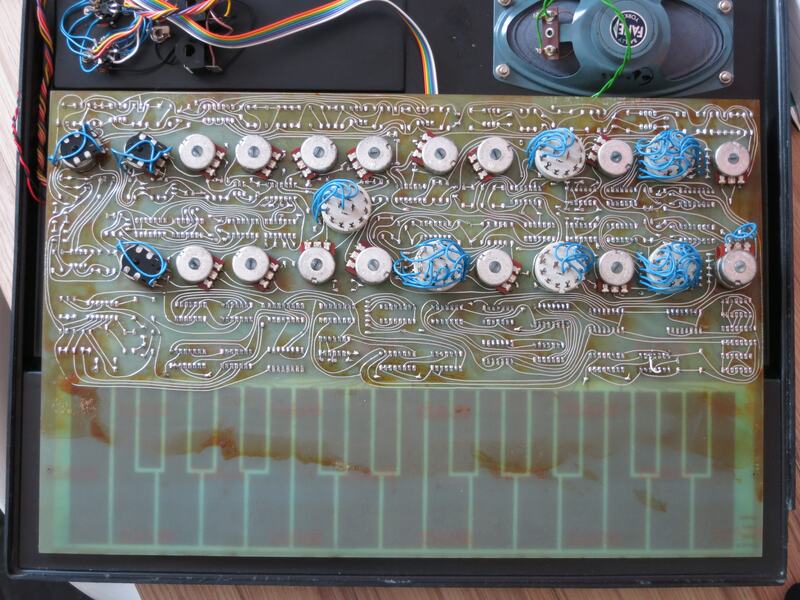 I’d suspected that chip because of the slightly dodgy top soldering, but all the continuity checks had worked out ok. I knew shotgun replacement of the keyboard ICs was probably not going to help, but I couldn’t see what else to do. Either way, at least those ICs are now fresh and socketed, they should last a good few years. 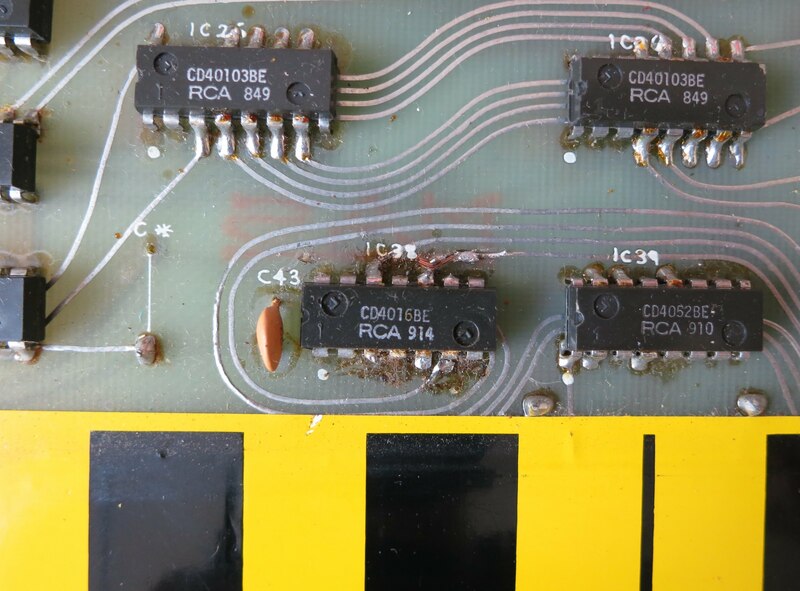 One minor wrinkle was that I found for the keyboard clock at IC35, that only certain 4069s had enough oomph to trigger the 4013 at IC44 – only an original RCA one, in this case. Other than the circuit board being a pain, being a single board the Wasp is easy to work on, and it helps that all the ICs are common-or-garden CMOS. Laurie Biddulph of Elby Designs redrew the schematic for the Wasp, and as far as the keyboard section goes, it seems to be correct. There’s also the original service manual and schematic available from Derek Revell’s site. There’s been lots written about the Wasp on Analogue Heaven over the years (sample subject line: “how do you plug a wasp into a spider?”). One thing I spotted that was possibly useful was Jürgen Haible noting that the LM386 power amp runs directly from the 9v DC input – which is probably the reason mine hums loudly when run from one adaptor, but hisses from another. I made a video of me fiddling badly with the fixed-up Wasp just to show roughly what it sounds like, reminiscent to me of “On the wires of our nerves”-era Add N To (X). The glide is nice, with the pitch of the two oscillators rising and falling at slightly different rates. I tried to edit some of the dull bits out, honest. Hi, I have a wasp with an issue with the keyboard, mostly a hanging note. I wandered if you do repairs as I wouldn’t feel confident, particularly with such an old and rare synth. I live in Coventry by the way. Aargh, sorry to hear yours is acting up. I’d really love to help but I’ve never done repairs for anyone else and I would really fret about making a mess of it, particularly with that annoying circuit board. 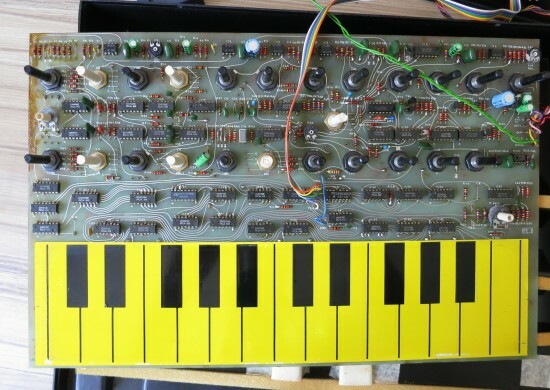 Presuming you’ve tried fiddling with the keyboard sensitivity control, if it’s just one note (or one set of keys) then I’d start by looking at the immediately connected ICs in the keyboard section (IC39/42/47), but if you’re not confident in replacing them then I’d recommend contacting James Walker at Synth Repair Services in Stoke-on-Trent, I imagine he’s seen a few of these in his time. Funnily/not funnily enough I got mine out the other day again after moving house and it’s mysteriously broken again but in a different way this time – when holding a key the note stutters in and out. Seems like it’s something finicky about the keyboard circuit ‘cos when briefly triggering a note it works fine. Firstly, apologies for such a long reply time! For some reason I hadn’t seen your response. I will certainly try the sensitivity, I think I adjusted this some time ago. It has a few other issues which are typically unpredictable so I may well try contacting James. Thanks for all the advice, its much appreciated and good to know other people still love and play these synths! a minute or 2 …. hello Pedro, sorry to hear about your poorly Wasp. I haven’t got much of an idea, I’m afraid. 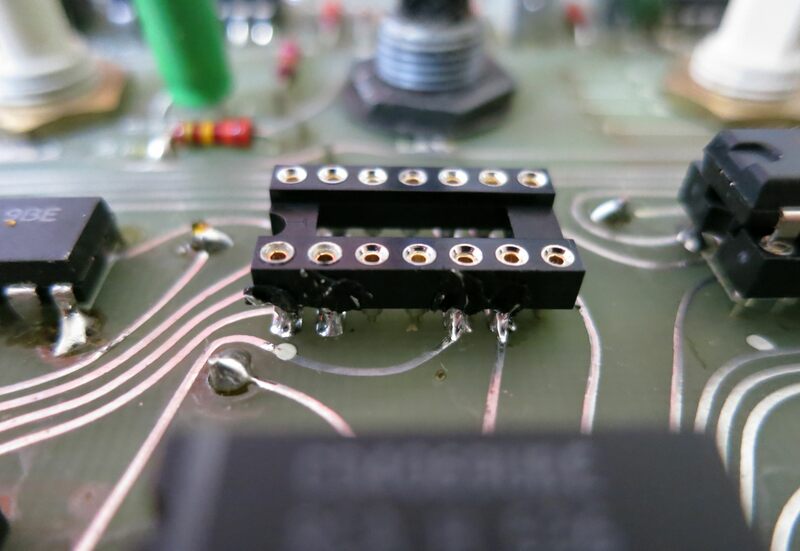 The only thing I could think of to try and narrow it down is to whip the top off, switch it on, and then put a finger on the IC bodies (maybe avoid the legs) to see if any of them get super-hot – it might be an indication that the component is failing. Yeah, I love my Wasp… when it works. I’m hoping to get another chance to have a go at it over Christmas. 4,7 uf on the 5v to mass on top of the wasp pcb , i just changed them , that was the fix 🙂 . on the left side were pots are did yiu fix it ? Pedro – excellent, glad you sorted it! Not sure I totally understand your last sentence – I’m guessing you’re asking about the two tracks on the far left-hand side. They look broken in the picture but (as far as I can remember) they aren’t – I’m sure I checked them with the continuity test in my multimeter at the time. Yep, fixed it (hopefully more than temporarily) and detailed over here. Let us know if that helps your poorly Wasp.